Graham Langley, Trevor Millum and Dez Allenby are appearing at Harrison's Restaurant for another evening of lies, falsehoods and deception. Can you ever believe a word you hear? How can you tell if it is real, a deceit or a real deceit? 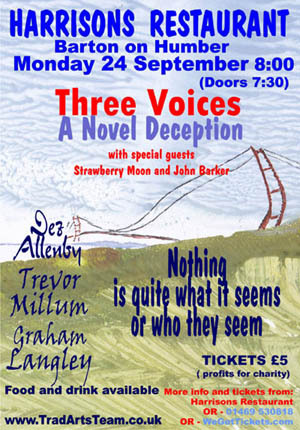 Leave all mistrust and cynicism at home and join the Three Voices for an evening of entertainment, playing with words, stories, songs and poems which intermingle throughout the night with special offerings from Strawberry Moon(shine) and John Barker. Strawberry Moon - from the full moon in the strawberry season. People have been heard to mention their ‘groovy rhythms’ and they get billed as a ‘magical folk/blues quartet’. It’s amazing what people believe! Their album, ‘Seeing Stars’ will be released on DHM on 7 September (if it hasn’t escaped already). They will be playing some songs from their album so sit back and enjoy. John is a longstanding member of the Magic Circle and, if they are not one already, he will be turning the majority of the audience into frogs. He prefers what he does to be described as "novelty deception" and let the audience decide if it is magic or not! Would you believe it?